Pissarro had a great influence on the impressionists; it was he who developed many of the principles which lay at the root of this style. The most well-known of his works are rural landscapes and Parisian cityscapes. His gentle tonal palette and the subtlety of his airy light are distinguishing features of his artistic manner. 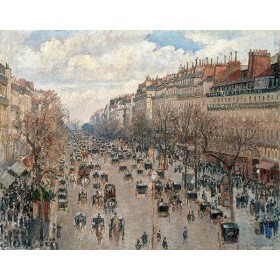 Pissarro painted over thirty canvases with the famous view of Montmartre Boulevard . Magnetic Notepad "Boulevard Montmartre in Paris"